Mela is a Hindi word for a fun fair. 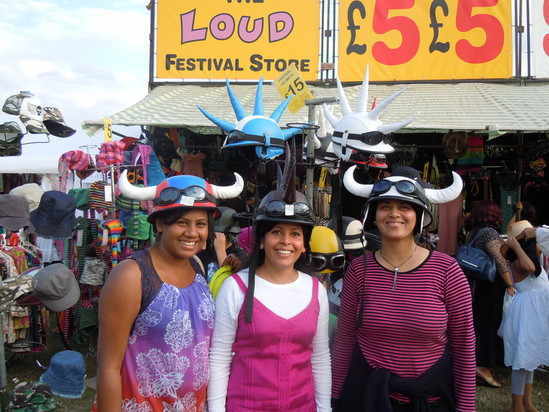 The London Mela 2010 was held in Gunnersbury Park in Acton town. Gunnersbury Park by following the sign boards. It was a very simple route anyway. After getting out from Acton town take left an keep walking till you reach the park. There is a road crossing in between. 1. Food - Samosas, bhajis, Lamb curry, chole bature, dosa, roasted corn and loads of stuff that I don’t remember. 2. Children's Park near by. b> A scary ride where the seats are at the 2 ends of a very long structure which rotates clock wise and anti clock wise. d> A ride where seats are arranged circularly but the plane of the direction of motion of the seats in not exactly vertical. 4. Other Games - a> Throwing rings on objects wrapped in money to win those objects. B> Throwing a soft balls at a structure built out of tins. An you win a huge soft toy if you manage to hit the tins and make them fall on the ground. There were 2 to 3 big stalls for such kind of games. C> Throwing basket balls in the nets to win soft toys. 5. Stalls giving out free Pakistani basmati rice for free. Stalls giving free drinks. 6. Pop stars performing live on two stages. 8. Bollywood dancing taught to the crowd in another stall. 9. Some guys dressed funnily in costumes of Octopus and other bird. 10. miscellaneous stalls of cosmetics, music, cars etc. 12. The game related to coloured ball throwing at each other. Mostly South Asian (India, Pakistani, Bangladeshi etc.) and European and British. People who attended with me (Girish Suryawanshi) - Shruti Vasant, Prachi Dighe, Ravi Vasant, Jayanthi Vasant.